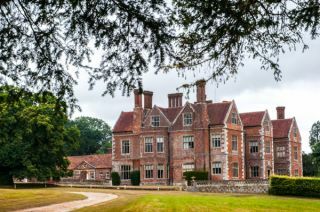 A Tudor manor house on the edge of the New Forest, Breamore was built in 1583 for the Dodington family. It was later the home of Edward Hulse, doctor to Queen Anne, George I, and George II. The house boasts a collection of 17th and 18th-century portraits, period furniture, porcelain, and fine art. In the grounds is the Mizmaze, a turf maze of medieval origin. 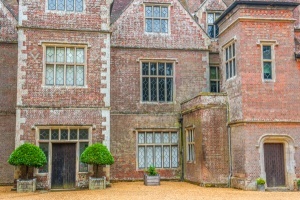 Breamore House is a perfect example of an E-shaped Elizabethan manor house. The man responsible for building Breamore was William Dodington, who was married to the sister of Elizabeth I's spymaster, Sir Francis Walsingham. In 1600 Dodington shocked London society by committing suicide, throwing himself off St Sepulchre's church tower. Ill fortune dogged the Dodingtons. In 1630 William's grandson, Henry, killed his mother and was hung at Winchester gaol. 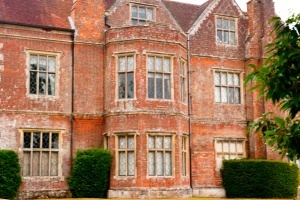 The Dodingtons remained at Breamore until 1748 when the house was sold to the Hulse family, who have owned it ever since. The house is very much a family home, with mementoes of generations of the Hulse family sharing space with a wonderful collection of artwork and period furniture. Among the most notable pieces of art are a pair of 17th-century tapestries by David Teniers and a landscape in the style of Breughel by the same artist. Another highlight is a portrait by Van Dyke of the three children of Charles I. On the first floor is an extraordinary series of 14 ethnographical paintings by an illegitimate son of the Spanish painter Murillo, showing the intermarriage of races in Mexico. In the West Drawing Room is a historically important portrait of a young man with a cricket bat and stumps, entitled The Boy with the Bat. Dated 1760, this is one of the earliest depictions of cricketers in existence. These are just a few highlights of the artwork on display. The rooms on view include the Dining Room, two drawing rooms, and three bedrooms. The most impressive room, however, is the Great Hall, measuring 84 feet long, with a plasterwork ceiling and two ornate Elizabethan fireplaces. The tour ends with a visit to the Victorian kitchen, where you will find the largest collection of copper cooking pots in England. 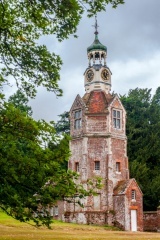 Just outside the main house is a striking tower that looks at first glance like a church tower, complete with a cupola. It is, in fact, a water tower, made when the Victorian Hulse's brought running water into the house via a gravity-fed water system. 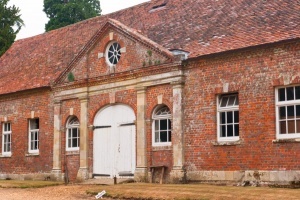 Aside from the house and the nearby Saxon church, Breamore is home to the Countryside Museum, where you will find rural crafts and tools covering centuries of country life. Here you can explore recreations of a blacksmith shop, farm worker's cottage, dairy, wheelwright's shop, saddler's shop, brewery, cider house, bootmaker's shop, and more. There is a collection of traction engines, steam engines, tractors, barn machinery, and all manner of agricultural tools. Museum: The Breamore Countryside Museum provides a fascinating look at village life in times past. See restored worker's cottages, shops, and an early garage. There is a large collection of early steam-powered farm vehicles. Even earlier is the four-train turret clock of Bavarian design. This clock dates to the late 16th century and is twice the size of the oldest clock in Britain at Salisbury Cathedral.